Lots of information about radiation levels are available. But at first glance, these data seem incomprehensible to anyone who didn’t have an advanced degree in nuclear physics . Here is a simple tutorial to calculate the biological impact of a given radiation exposure. If the measure is in microsievert per hour (uSv/h), divide by 1000. You obtain a value in millisievert per hour (mSv/h). Multiply by the time of exposure in hour. You obtain a value in millisievert (mSv). 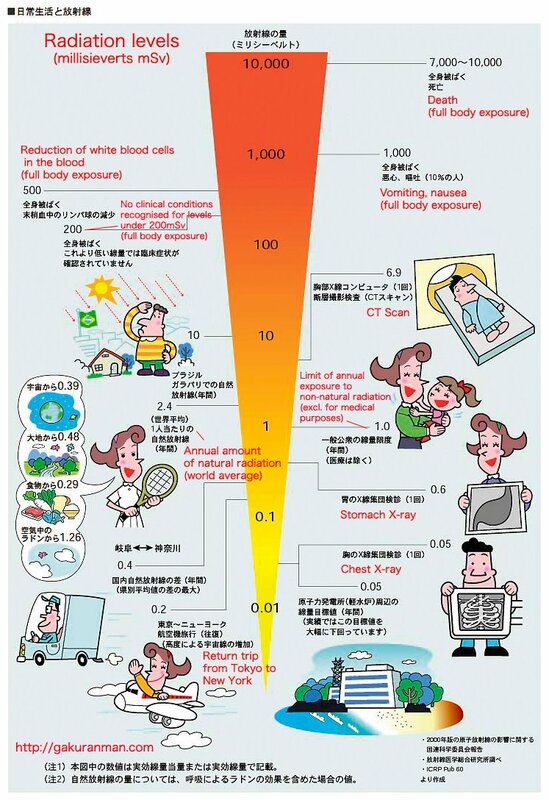 Calculate the biological impact of the exposition to the radiation with the chart below. We take average value for Tokyo area (line 13) given by Japanese government on March 17th : 0.05 uSv/h. We divide by 1000 : 0.05/1000 = 0.00005 mSv/h. The time of exposure is 24 hours so we multiply by 24. 0.00005*24 = 0.0012 mSv. If we multiply this value by 365 to compare it with annual values, we obtain : 0.0012*365 = 0.438 mSv. Following the chart, the radiation dose received for an annual exposition to this radiation level is equivalent to the one received for an annual exposition to the natural background (~0.48 mSv). There is no need to take any emergency measure. Please send me your other radiation level sources. Please translate this post into Japanese. Please broadcast !